Our electricians have extensive experience in new wiring for both residential and commercial areas of construction in the Colorado Springs area. 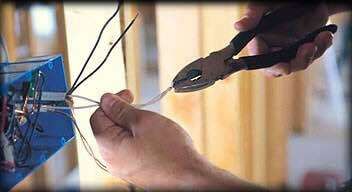 From new homes out of the ground to homes that have been completely gutted and in need of a new service and re-wiring. Often in this case co-ax and telephone is necessary and we can help with these needs also. Commercially we have done as simple a job as adding new circuits for outlets and all the way up to new services for water jet equipment used for cutting metal plates.